The yellow fever mosquito (Aedes aegypti) is widespread throughout the tropical and subtropical regions of the world. 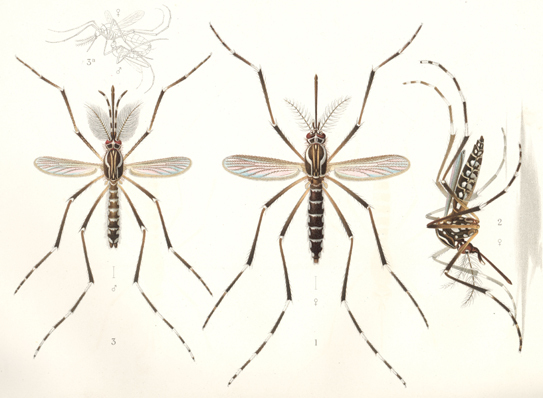 Aedes aegypti was the target of a hemisphere-wide eradication effort to eliminate yellow fever in the Americas during the period from late 1940’s to the early 1970’s. By 1962, 18 countries plus several islands in the Caribbean announced they had eradicated the mosquito, largely through a spraying program involving DDT and well-funded programs to train personnel to conduct the necessary field work, and purchase equipment and supplies. Unfortunately, after 1962 only three more countries or territories eliminated the vector. Not every country in the Hemisphere had been willing to participate in the eradication program and over time, these countries became sources of reinfestation for those that had eradicated the vector. By 1972, eradication of the vector had been achieved in 21 of the countries of the Region. However, a growing lack of political support and, in some cases, complete abandonment of the programs led to a reversal of the progress gained in previous years and by 1997, virtually all the countries of the Americas that had eradicated Ae. aegypti were reinfested, including the southern United States. The documented range of Ae. aegypti in the United States (as of October 2016) is shown in the map below. This map is from a recent paper by Micah Hahn and co-authors from the Centers for Disease Control and Prevention (CDC) that represents the best estimate of the potential range of Ae. aegypti based on data collected from a variety of sources. Click here to download the article containing the map. In total, 220 counties in 28 states and the District of Columbia reported finding at least one Ae. aegypti mosquito, including every state in the southern tier of the U.S., according to Hahn and colleagues. They said 101 counties from 16 states and the District of Columbia reported finding the mosquito in 3 or more years. With the updated data, the current distribution of Aedes aegypti extends to 220 counties in 28 states and the District of Columbia, with the heaviest concentration in Southern California, Arizona, Texas, and Florida. This dark-colored mosquito is about 3-4 mm long. It can be identified by a marking in the form of a lyre on the dorsal side of the thorax, and striking white and black patterns on the legs. Because egg laying, larval development, resting and feeding all occur in close association with human habitations, populations of Ae. aegypti may at times reach levels sufficient to become a serious pest. 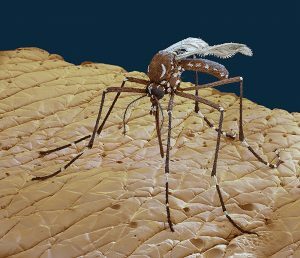 Living in such close association with humans dramatically increases the potential of this mosquito to transmit pathogens to humans. The adults do not disperse widely and seldom range more than a few hundred meters from the place where they emerged. This is especially true for males and their presence is a dependable indicator of a nearby breeding place. This species regularly enters houses looking for hosts or places to rest. In a study of 979 houses in the city of Acapulco, Mexico, the primary resting locations for Ae. aegypti included bedrooms (44%), living rooms (25%), bathrooms (20%), and kitchens (9%). Over 80% were found resting within 1.5 meters of the floor. The females are strongly attracted to and preferentially feed on humans throughout the day. Biting can also occur at night, especially in lighted rooms. Aedes aegypti may take only a partial blood meal if disturbed while feeding and may complete feeding on other hosts. This defensive behavior may serve to increase virus transmission by exposing more hosts to infective bites. This species is a very cautious feeder and often approaches unseen to bite around the ankles. The life cycle of Ae. aegypti is typical for “container breeding” mosquitoes. Female mosquitoes lay their eggs in natural and artificial containers subject to flooding. These include: flower pots, vases, buckets, water barrels, rain gutters, discarded cups and bottles, plants that hold small quantities of water, or any other containers. This species practices what is referred to as “skip oviposition” which means that an individual female will deposit her eggs in multiple containers rather than an entire batch in a single container. Previous reports for Ae. aegypti estimate that females of this species deposit around 10-30 eggs per container when dispersing them over several containers. The eggs are deposited above the water line and are resistant to heat and dryness. 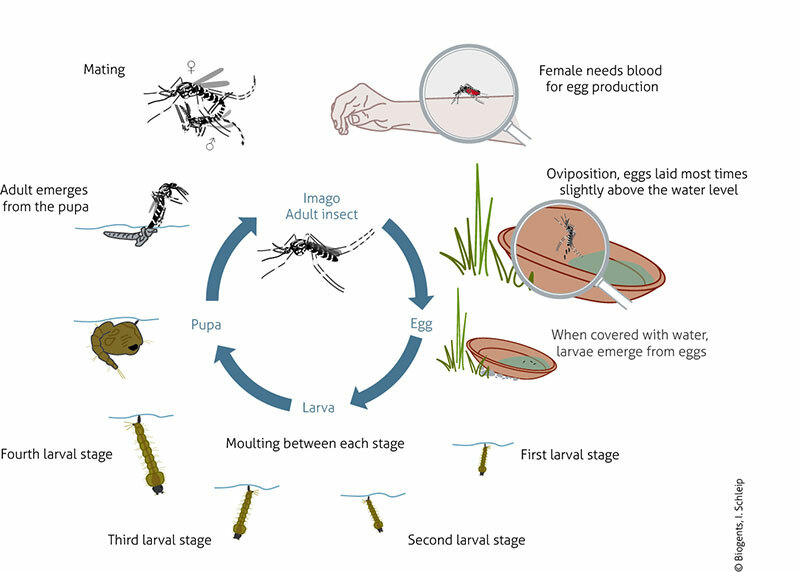 When eggs are covered by water, they hatch and larvae emerge. There are four larval stages that feed on organic material that they filter out of the water with their mouthparts. Larvae are commonly seen hanging at the surface of the water where they breathe through a snorkel-like siphon at the tip of the abdomen. The fourth-stage larva changes into a pupa, that is comma shaped and tumbles through the water. Pupae breathe air through two snorkel-like siphons. The pupa is a non-feeding stage where the mosquito changes from the larval form into an adult insect, or imago. After a few days, the adult mosquito emerges from the pupa. After emergence, both sexes take nectar and sugary fluids from whatever sources are available as a source of energy. Mating normally takes place within a few hours after emergence and once inseminated, a female may seek her first bloodmeal within the next two days. Only females feed on blood which provides protein required to develop eggs. Over her lifetime, a female can potentially produce several batches of eggs, provided that she obtains a blood meal each time. The yellow fever mosquito is not only the main vector of yellow fever, but also of dengue fever, chikungunya and Zika. While yellow fever has not occurred in the U.S since 1905, the disease is still causes an estimated 84,000 to 170,000 severe cases of disease and 29,000 to 60,000 deaths annually primarily in African, Central and South America. With the ease and rapidity of world travel today, it is not beyond the realm of possibility to envision the potential for another yellow fever epidemic in areas of the US where Ae. aegypti is well established. Periodic local transmission of dengue by Ae. aegypti has been reported from Florida and south Texas. In 2009 -2010, a locally transmitted outbreak of dengue was identified in Key West, FL. During the summer and fall of 2009, 22 cases were identified and in 2010, an additional 66 more cases reported. In 2016, Ae. aegypti was responsible for transmitting Zika virus to 285 people in Florida and 6 in Texas. This species remains a very real threat to transmit a number of mosquito-borne viruses in areas where it has become established. 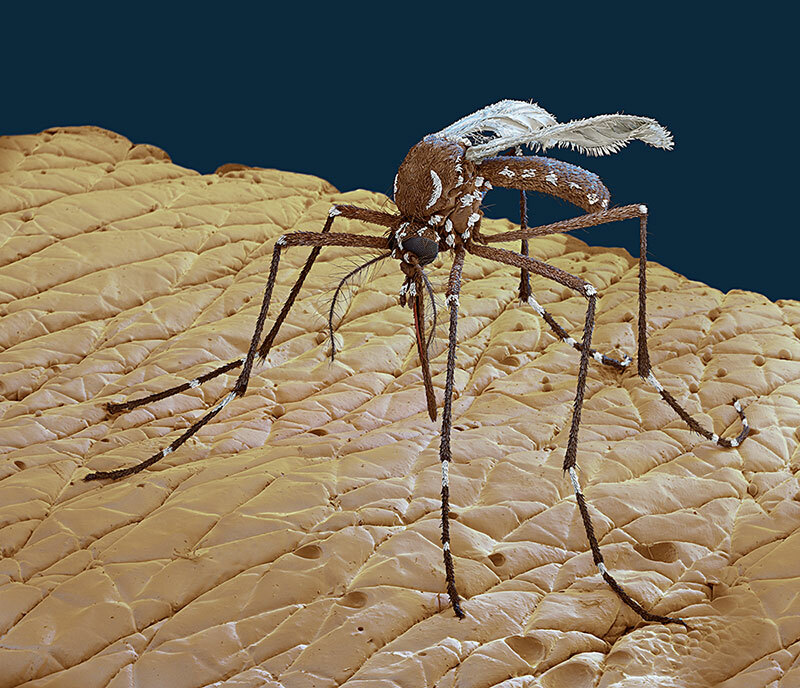 Scanning electron microscope image of an adult yellow fever mosquito and a larva.